The Wakenaam Cricket Committee (WCC) and Birbal Contracting Establishment have teamed up for the staging of a round robin T20 tournament on the Island. 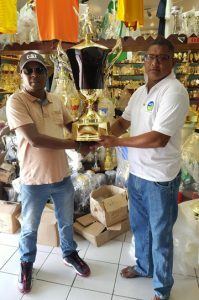 Secretary of the WCC Nazeer Mohamed (right) accepts the winning team trophy from Abdel Birbal. The inaugural tournament, which was launched yesterday at Trophy Stall, Bourda Market, will be contested by seven teams in two zones with the top two from each zone going through to the semi finals. Sans Souci Jaguars, Sans Souci, Good Success, G Square Cavaliers, Zeelandia, Maria’s Pleasure and Noitgedacht will battle for supremacy from March 31. CEO of Birbal Contracting Establishment, Abdel Birbal, a former resident of Wakenaam said he is happy to be associated with sports development and to be able to give back to the place of his birth. He stated that sports play an integral part in the development of the youths and will help them to become well rounded individuals. He spoke about the importance of fitness and discipline and wished the teams well. He lauded the WCC for the role they have been playing in promoting the sport there adding that he is looking forward to an exciting and successful competition. Secretary of the WCC, Nazeer Mohamed expressed gratitude to Birbal for his commitment and said the draw will be made shortly to determine the zones. Mohamed said that the players are excited about the venture, adding that the WCC is looking forward to continued support from Birbal.